MOSCOW (Sputnik) - South Korean President Moon Jae-in has been given two Pungsan dogs by North Korean leader Kim Jong-un after their recent joint summit in Pyongyang, the Yonhap news agency reported on Sunday, citing the presidential press service. The press service said that the South Korean side received the female and male dogs on Thursday, they were named Songkang and Gomi, according to the media. The outlet added that Moon already has a Pungsan breed dog, meaning that the South Korean president will become the owner of three such dogs. 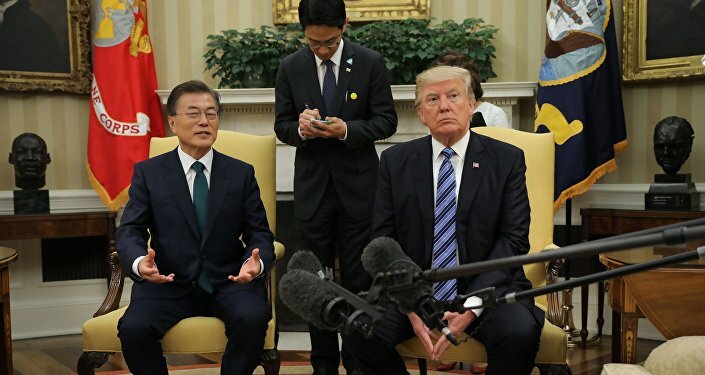 Earlier in September, Moon and Kim held their third meeting this year, contributing to the improvement in relations between the two countries that have been divided since the end of World War II. The situation on the Korean Peninsula has significantly improved over the last few months, with North Korean leader Kim Jong-un pledging to give up his nuclear aspirations and having held three rounds of talks with his South Korean counterpart Moon Jae-in and a historic summit with US President Donald Trump in Singapore in June. Trump and Kim, in particular, reached an agreement that required Pyongyang to denuclearize in exchange for a freeze on the US-South Korean military drills and eventual sanctions relief.